In Somerville, they’re planning the city’s first elevated bike lanes, to be separated from traffic by a curb and the sidewalk by a buffer zone with plants. In Salem, they’re planning to connect the Salem State campus and the Marblehead Rail Trail to an off-road path reaching into downtown. That trail could eventually join the off-road East Coast Greenway stretching from Canada to Florida. Beverly and Lowell this year adopted the Complete Streets program, which requires city engineers to consider all users when improving roadways, making accommodations for bicyclists and pedestrians where appropriate. There’s work being done to connect rail trails in Topsfield and Boxford, as well as trails in Amesbury, Newbury, Newburyport, and Salisbury. This year, a portion of the Northern Strand Trail was built in Revere, providing the missing link to create 7½ miles of continuous off-road riding from Everett, through Malden, Revere, and Saugus, to the Lynn line. Road projects considering bicyclists and pedestrians are planned for Bridge Street; the Beverly/Salem bridge; Routes 97 and 1A; and River Street. Bike lanes to be painted on Brimble Avenue, with plans to add shared bicycle/pedestrian paths. Signs, shared lane markings, and possible traffic-calming measures are planned for Cabot Street. Improvements along the Merrimack River and boardwalk will include accommodations for bicyclists, pedestrians. Plans to connect off-road paths. Working with state to make VFW Highway safer for all users. 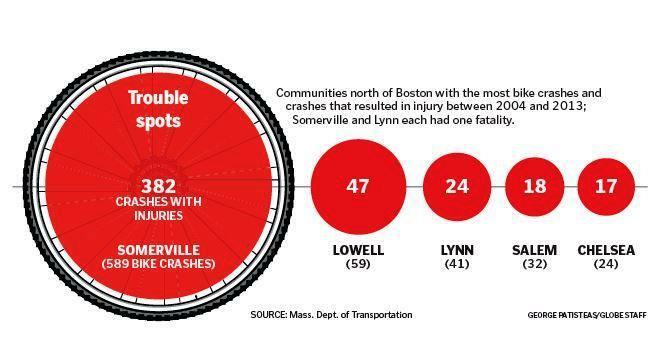 Working with UMass Lowell to make Pawtucket Street safer for bicyclists, pedestrians. ? Safety improvements at VFW Highway/Bridge Street intersection, including realigning road and shortening pedestrian bridge. Planned redevelopment project to make Lowell Overpass safer. Planned waterfront project could include three pedestrian bridges over Lynnway and boardwalk connecting to Lynn Shore Drive. Shared bicycle/motorist lane markings on Lynnfield Street. Accommodations along Bridge Street to the train station. More bike lanes planned for Lafayette Street (Route 114). Off-road path planned along Canal Street to connect Salem State campus and the Marblehead Rail Trail to the downtown. Spring construction start planned for first elevated bike lanes, along Beacon Street from Cambridge’s Porter Square to Inman Square. Safety improvements for Holland Street south of Teele Square. ? Safety improvements are being studied for Elm Street near Davis Square.